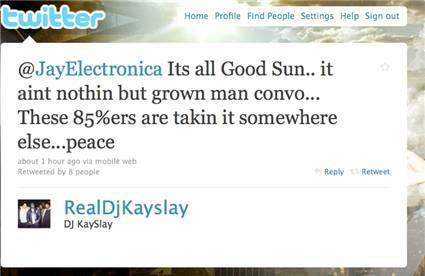 Last week I made a post about this Twitter beef 9th Prince was starting with Jay Electronica over some comments he made about The RZA. DJ Kay Slay also took some offense to what Jay was saying in the interview and made his own comments via Twitter. It seems that from the above Twitter post that Kay Slay and Jay Electronica have squashed their "beef" peacefully. 9th Prince however seems to still be taking minor shots at Jay via his Twitter. Jay almost comes off like he's still angry in this video interview (which you can see below) and I got to admit that I still get a slightly disrespectful tone coming from him despite what he says. Shouldn't he have an album out by now btw? Whatever, hopefully this all marks the end of this "non-beef" and people can get back to making music.